Mary Ann Budde Nichols, age 95, passed into eternal rest on August 9, 2018. 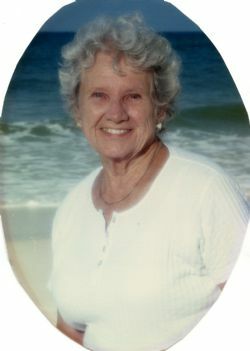 Beloved wife of the late James Burke Nichols. Predeceased by her loving parents, Joseph Budde and Regina Timmerman Budde. Dear mother of Pat (Richard) Sahr, Peggy Stringer, Pam (the late Tom) Herrington, Jim (Sandy) Nichols, the late Janet Harknett (Peter), Kathy (Bob) Judson, Bill (Maria) Nichols, and Mike (Kelley) Nichols. Dear grandmother of Aaron, Ben, Dorothy, Ruth, Jamie, TJ, Michael, Robert, Allison, Jay, Amy, Nick, Shannon, Max, Matt, Eric, Alex, Maggie, Janet, Sam, Emma, and Lila. Dear sister of Joseph Budde, the late Thomas Budde, the late Sr. Gertrude Budde, and Jane Budde Wuesthoff. And long time, devoted friend of Margie Payne and Bobbie Fazio. After Jim's death, Mary Ann became active in many civic projects and was also a generous donor of time and money to several causes. Among them are Meals on Wheels, Our House, Arkansas Children's Hospital, CARTI, and Christ the King Catholic Church. Accomplished in most areas of needlework, Mary Ann sewed many of her children's clothes, stitched blankets for new grandchildren, crocheted afghans for everyone in the family, and knitted hundreds of caps for infants in NICU. Mary Ann was an avid, life-long reader who learned to use an IPad when her eyes deteriorated. She was famously known to say: "Don't say you're bored if there's a book in the house." Mary Ann was a sports enthusiast all her life. She rooted for the St. Louis Cardinals from the time she was a member of the Knot Hole Gang in the 1930s right through most of the 2018 season. Throughout her life, she was interested in sports both as a player and a spectator. Mary Ann was most proud of her 8 children's, twenty-two grandchildren's and fifteen great-grandchildren's accomplishments. She never forgot what anyone was doing at any given time, and was especially proud of all their educational achievements. Click Play below to view the Video Memorial for Mary Ann Nichols.